For a recent blog post for Comic Kingdom’s Ask a Cartoonist we were given the general topic of what was on your nightstand for Drop Everything and Read Day. Sally, Ted and Hillary are definitely readers. In a recent strip I had Ted reading Wolf’s Inferno, a real action thriller written by Sally Forth’s previous artist, Craig MacIntosh. For Hil and her friend Faye it’s graphic novels – lots of Easter Eggs in strips like this for people into comics. 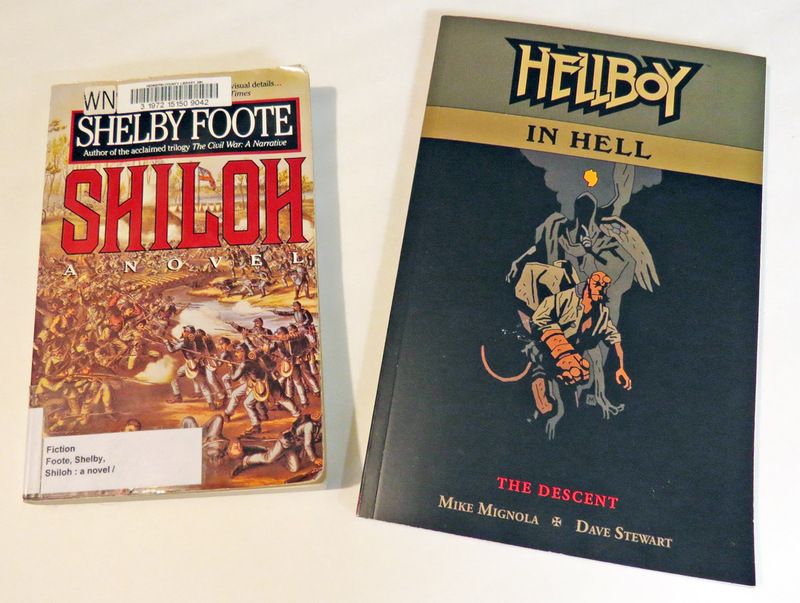 As far as what’s on my nightstand; I currently have Shiloh which is a fictional re-creation of the battle of Shiloh in April of 1862 by renowned historian and author, Shelby Foote. I also have Hellboy: The Descent by master cartoonist Mike Mignola. I’ve been working real hard of late to set apart more time to read. I feel my mind goes stagnant without it.